Add high speed, wide format color laser printing to your office workgroup with the affordable HP Color LaserJet 5500 printer series. Easy to use and flexible to fit any office, these printers create high quality color and black and white documents as quickly as 21 ppm. With 600 dpi resolution you get vibrant image quality that make your presentations stand out. The 5500dtn has a 400 MHz processor, and a minimum of 160 MB RAM for a fast, 18 second first page out. 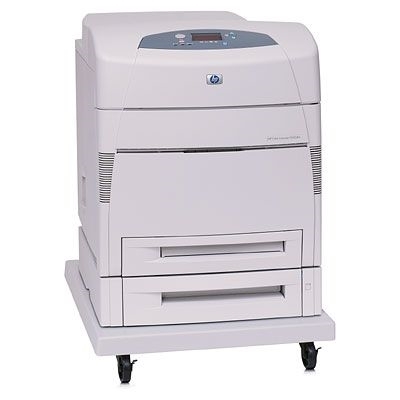 This great printer is equipped with an Automatic Duplexer for double sided printing and the HP jetdirect Fast Ethernet internal print server for trouble free high-performance printer sharing. In addition, the 5500dtn has a 1,100 sheet input capacity and comes with a printer stand. Long life maintenance kits, smart printing supplies, and low intervention rates help to provide low cost of ownership and operation.